Ceremony • South Korean diplomats present the medals to 181 soldiers, some posthumously. 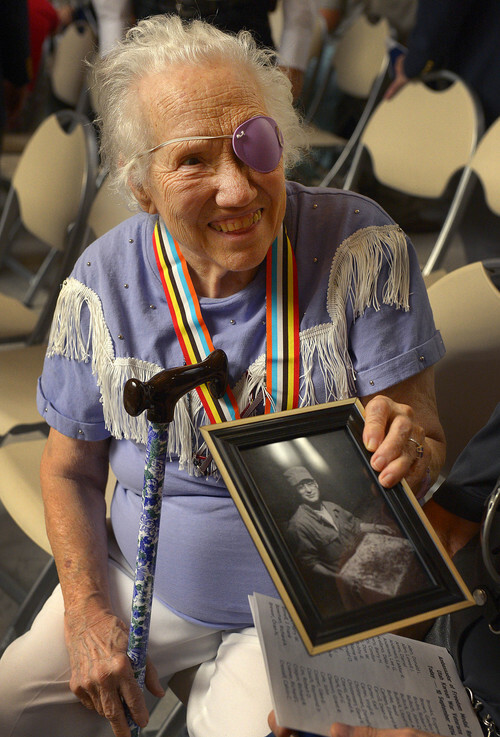 Leah Hogsten | The Salt Lake Tribune One hundred eighty one Korean War veterans were presented with a medal from the government of The Republic of Korea and recognized for their service, Wednesday, September 10, 2014 in the Utah Capitol rotunda. Leah Hogsten | The Salt Lake Tribune Darlene Morrill is all smiles after accepting the medal intended for her husband Milo Merrill, who passed away in 1999. One hundred eighty one Korean War veterans were presented with a medal from the government of The Republic of Korea and recognized for their service, Wednesday, September 10, 2014 in the Utah Capitol rotunda. 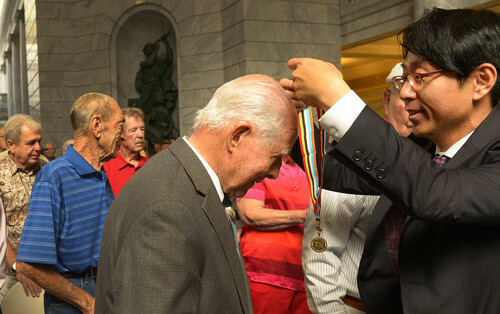 Leah Hogsten | The Salt Lake Tribune Marvin Johnston and fellow Korean War veterans were presented with a medal and a proclamation from the government of The Republic of Korea and recognized and honored for their service, Wednesday, September 10, 2014 in the Utah Capitol rotunda. Leah Hogsten | The Salt Lake Tribune WWII Marine veteran Gene Silotti accepted a medal on behalf of his brother Jack Silotti, who served in the Korean War with the Marines and passed away two months ago. One hundred eighty one Korean War veterans were presented with a medal from the government of The Republic of Korea and recognized for their service, Wednesday, September 10, 2014 in the Utah Capitol rotunda. Leah Hogsten | The Salt Lake Tribune The Utah National Guard posts the colors during the ceremony. One hundred eighty one Korean War veterans were presented with a medal from the government of The Republic of Korea and recognized for their service, Wednesday, September 10, 2014 in the Utah Capitol rotunda. 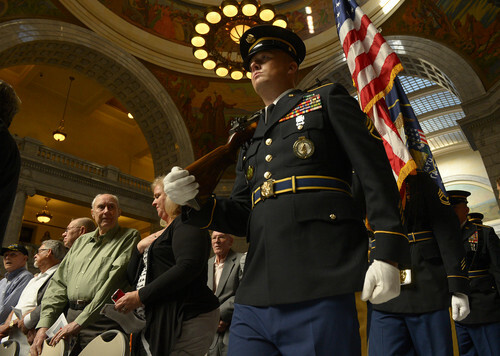 Leah Hogsten | The Salt Lake Tribune One hundred eighty one Korean War veterans were presented with a medal from the government of The Republic of Korea and recognized for their service, Wednesday, September 10, 2014 in the Utah Capitol rotunda. Leah Hogsten | The Salt Lake Tribune "I'm glad they remembered us," said Ken Fukawa, "but there's so many that are gone." 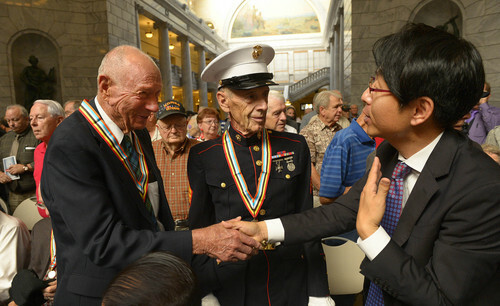 Korean War veterans were presented with a medal from the government of The Republic of Korea and recognized for their service, Wednesday, September 10, 2014 in the Utah Capitol rotunda. Leah Hogsten | The Salt Lake Tribune J. Frank Bonell receives his honorary medal. One hundred eighty one Korean War veterans were presented with a medal from the government of The Republic of Korea and recognized for their service, Wednesday, September 10, 2014 in the Utah Capitol rotunda. Leah Hogsten | The Salt Lake Tribune One hundred eighty one Korean War veterans were presented with a medal from the government of The Republic of Korea and recognized for their service, Wednesday, September 10, 2014 in the Utah Capitol rotunda. 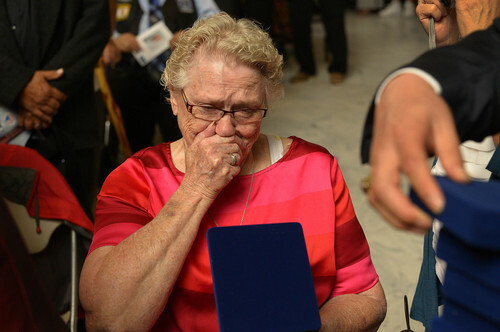 Leah Hogsten | The Salt Lake Tribune Louise Allen of Salt Lake City weeps for her husband Donald Allen, a WWII, Korean and Vietnam veteran who served for 27 years in the armed forces, after accepting the medal meant for her husband. Allen passed away in September 2013. One hundred eighty one Korean War veterans were presented with a medal from the government of The Republic of Korea and recognized for their service, Wednesday, September 10, 2014 in the Utah Capitol rotunda. 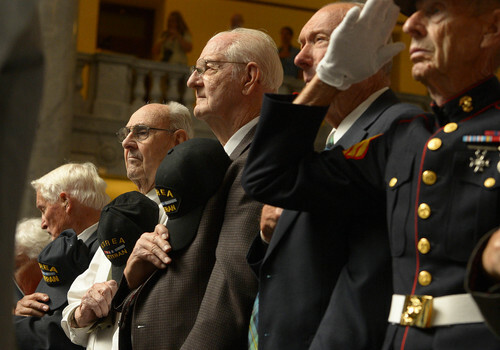 Leah Hogsten | The Salt Lake Tribune One hundred eighty one Korean War veterans were presented with a medal from the government of The Republic of Korea and recognized for their service, Wednesday, September 10, 2014 in the Utah Capitol rotunda. Leah Hogsten | The Salt Lake Tribune Korean War veteran John Cole delivered the keynote address. One hundred eighty one Korean War veterans were presented with a medal from the government of The Republic of Korea and recognized for their service, Wednesday, September 10, 2014 in the Utah Capitol rotunda. Leah Hogsten | The Salt Lake Tribune Don Lubeck of Clearfied (left) is thanked for his service by a member representing the government of The Republic of Korea (right). WWII Marine veteran Gene Silotti (center) accepted a medal on behalf of his brother Jack Silotti, who served in the Korean War with the Marines and passed away two months ago. One hundred eighty one Korean War veterans were presented with a medal from the government of The Republic of Korea and recognized for their service, Wednesday, September 10, 2014 in the Utah Capitol rotunda. 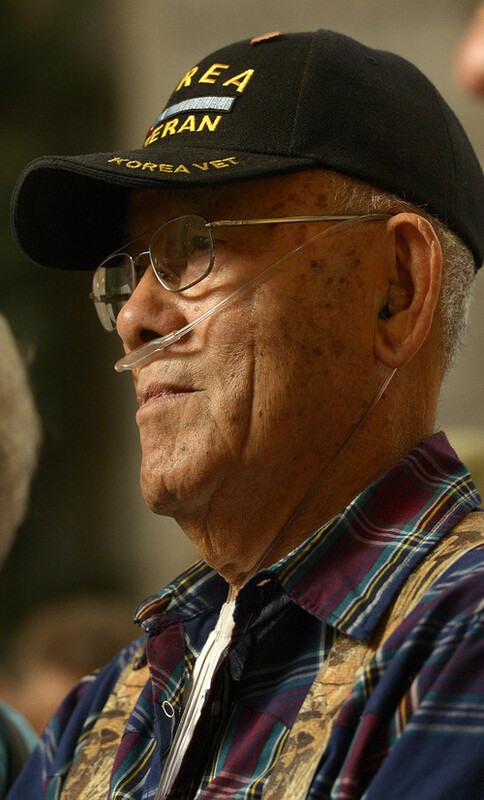 Leah Hogsten | The Salt Lake Tribune Members representing the Republic of Korea handed out medals to 181 Korean War veterans. 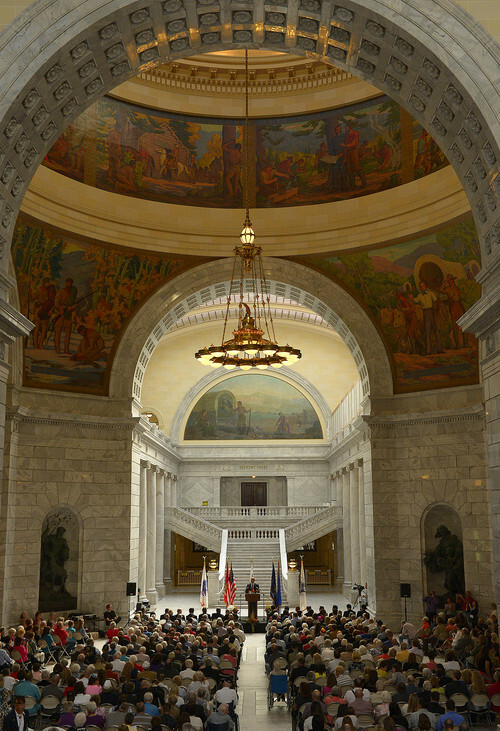 The veterans were presented and recognized by The Republic of Korea for their service, Wednesday, September 10, 2014 in the Utah Capitol rotunda. 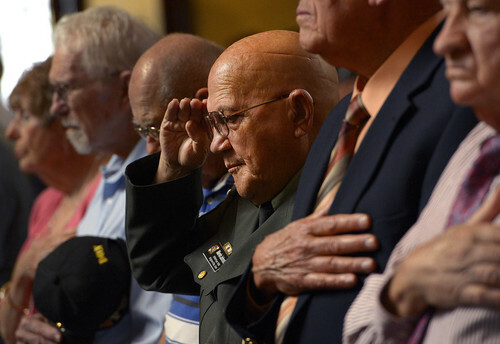 Leah Hogsten | The Salt Lake Tribune One hundred eighty one Korean War veterans were presented with a medal from the government of The Republic of Korea and recognized for their service, Wednesday, September 10, 2014 in the Utah Capitol rotunda. Milo Morrill spent all of 1953 in South Korea as a sergeant in the U.S. Army. Morrill died in 1999. Had he lived longer, his widow, Darlene Morrill, said Wednesday, he would have wanted to go back. "He said he would have loved to go back and see the people," Darlene Morrill, 80, said. Milo Morrill was among 181 Korean War veterans who  in person or posthumously  received recognition from the South Korean government Wednesday in a ceremony in the Capitol rotunda. 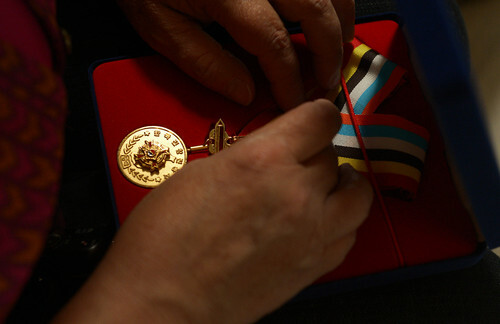 The veterans received the Republic of Korea Peace Medal. In a ceremony before the presentation of the medals, South Korean Consul General Dongman Han thanked the veterans for helping make his country a prosperous nation. "Your sacrifice and devotion will be forever recorded in history," Dongman said. Dongman then told the veterans they are now "ambassadors for peace." 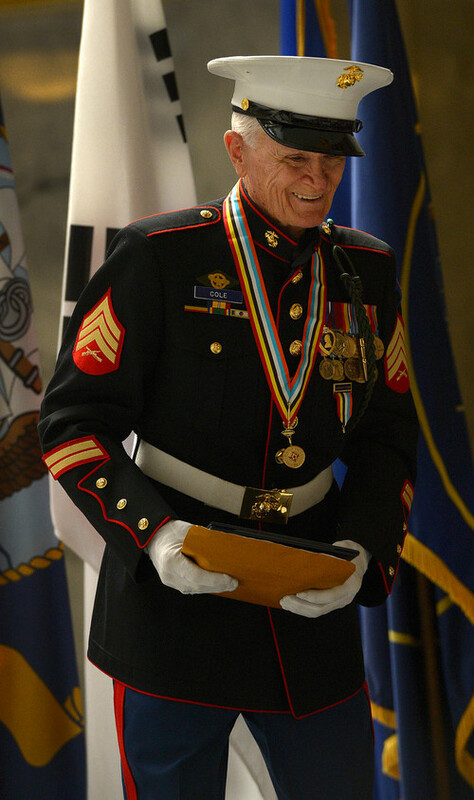 Dongman draped the first medal around the neck of former Marine Corps Sgt. John Cole, of Roy. Cole was wearing his old, dark blue dress uniform. 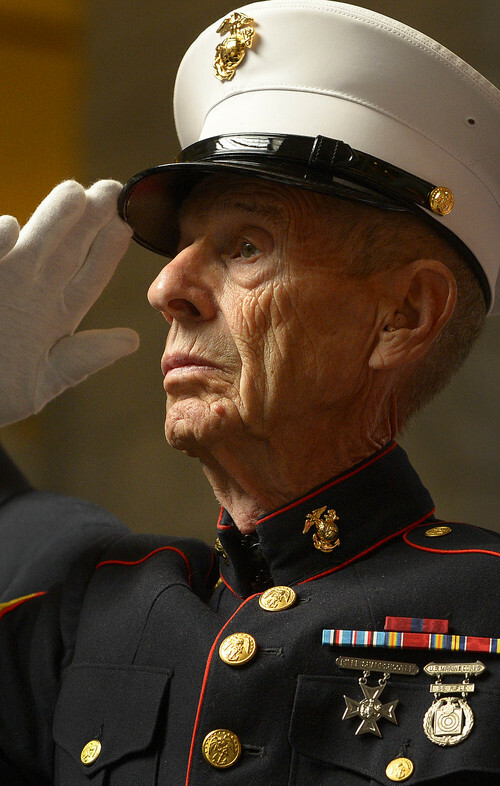 He was with the First Marine Division during the war and received three Purple Hearts. Later, he helped construct a memorial at Hill Air Force Base to the 1950 Battle of Chosin Reservoir. Members of the South Korean delegation then walked into the crowd to distribute medals to veterans or their families. 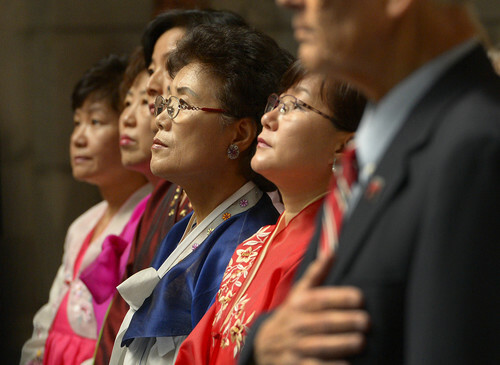 Women from the delegation wore colorful, traditional South Korean dresses. Veterans, widows and surviving children and others from the crowd of 500 people posed for pictures with the delegation and the medals. The distribution of medals and picture-taking took about 15 minutes. When the medals were handed out, Cole went to the stage. 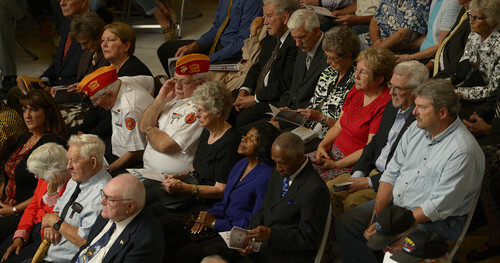 He encouraged the audience to find other Korean War veterans in Utah so they can receive medals, too. "Our goal is to make sure every Korean War veterans receives what we have here today," he said. 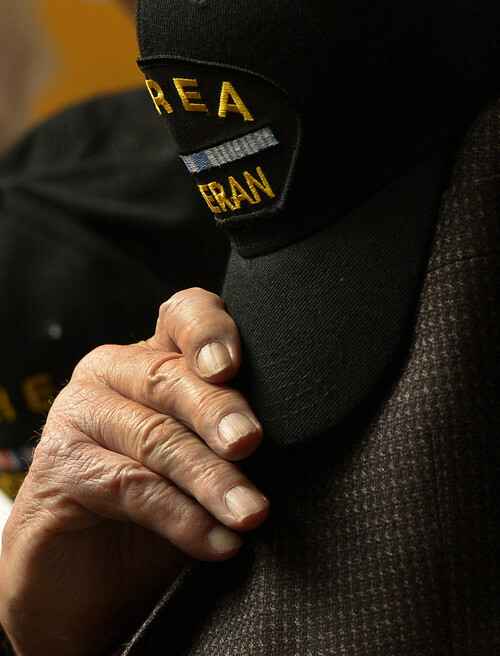 According to the Utah Department of Veterans and Military Affairs, 17,000 Utahns served in the Korean War. One hundred forty-one died in combat. Gene Silotti, an 86-year-old World War II veteran from Holladay, accepted the medal on behalf of his brother, Jack. He died in December at age 88. Jack Silotti served in the Marines during World War II, was discharged in 1945, and then was recalled to service when the Korean War began.
" &apos;I don&apos;t want to fight anymore.&apos; I remember him saying that," Gene Silotti said Wednesday, "but like a good citizen, he did his duty."